Cinnamon Oil is one of the most popular herbs and spices. Though cinnamon oil has numerous health benefits, it often causes irritations and allergic reactions. Therefore people prefer to use cinnamon directly instead of using the oil. This article, therefore, provides health benefits of cinnamon. The general benefits of cinnamon oil are given at the bottom. Cinnamon, which has the scientific name Cinnamomum zeylanicum, has originated from tropical Asia, especially in India and Sri Lanka. Now the shrub is grown in almost every tropical region of the world. The herb, owing to its vast medicinal uses, had found a prominent position in traditional medicines, especially Ayurveda (the traditional Indian medicinal system). Traditionally cinnamon, due to its medicinal properties, has been used in many cultures for treating a variety of health disorders including diarrhea, arthritis, menstrual cramps, heavy menstruation, yeast infections, colds, flu, and digestive problems. SYNONYMS: Ceylon Cinnamon, Cinnamon oil, Cinnamomum zeylanicum, Cinnamomum verum. The bark of the cinnamon tree contains about 0.5% to 1% cinnamon oil. This oil is extracted by pounding the brown bark of the plant. The bark is softened and broken down further by sea water and immediately distilling the extract. The oil extracted in the process contains cinnamaldehyde or aldehyde of up to 60%, thus making it aromatic. It is this bark oil that is more in demand because of its effectiveness in terms of its healing abilities. Yet it is the leaves of the plant which contains more of the oil, at about 1.6% to 1.8%. When the oil is extracted from its source, it acquires a sweet scent and has a color that ranges from yellow to brown. In this form, cinnamon oil contains many chemical substances like linalool, eugenol, beta-caryophyllene, methyl chavicol and cinnamaldehyde. This mixture of substances makes cinnamon oil a potent agent that possesses many healing properties. It has acquired a good reputation as a cooking ingredient and a valuable health supplement. Cinnamon has been used for more than 4,000 years, as proven by the records from ancient Egypt and China. It was mentioned in the Bible in the book of Psalms and Song of Solomon. This oil was regarded as a valuable substance that commanded a high price. It was so expensive then that the traders kept their source hidden to ensure the monopoly of the oil. It can be used as an anti-fungal and anti-skin disease agent. The substance cinnamaldehyde in cinnamon oil makes it act as an antifungal and the element diterpenes enables it to act like an antihistamine. If you have candidiasis, drinking one cup of water mixed with one drop of this oil will treat the disease. Cinnamon oil is known to have a warming effect therefore it can alleviate your rheumatic and joint pains. You can use cinnamon oil derived from the bark for killing harmful bacteria. Mixing it with your food will not only add flavor to it but will also kill the infectious germs inside your body. Cinnamon oil can be used as a food preservative. If you add it to your food in diluted amounts, it will preserve its freshness because it works like a preservative and an anti-oxidant. You can use cinnamon oil in controlling the spread of mosquitoes in your area. Dilute a small amount of cinnamon oil in water and sprinkle it around your house or bodies of stagnant water where you think mosquitoes hide and it will destroy their larvae. Cinnamon oil will also deter mosquitoes from attacking you. Just dab a small amount of cinnamon oil in your body lotion or dilute the oil in water and use it for washing your clothes. Mosquitoes will stay away from you because of the cinnamaldehyde content of the oil which can kill them. You can also use it as massage oil if mixed with patchouli oil at a ratio of 1:50. It acts as a skin astringent and can improve your blood circulation. 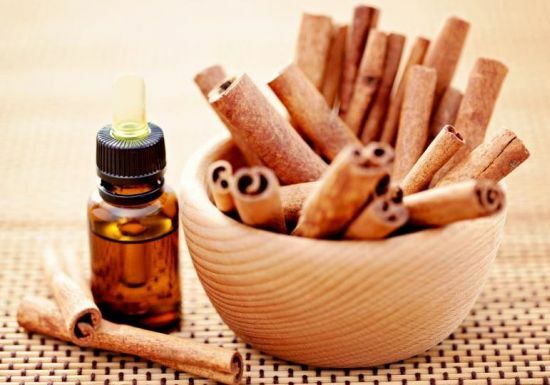 Cinnamon oil can be used as aromatherapy oil. It helps relieves stress and depression. It can improve your mental functions by soothing your mind and inducing sound sleep. You can also use cinnamon oil to treat your diarrhea and flatulence. It helps to normalize your digestive patterns. Use cinnamon oil with your hot compress and your menstrual spasms will be minimized.